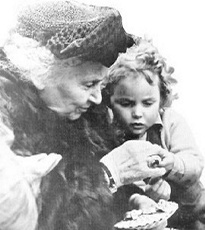 The Montessori method of education is based on the observations and discoveries of Italian physician and educational pioneer, Dr Maria Montessori (1870-1952). The Montessori nursery school is called the Children’s House because everything within it is designed to allow the child to feel safe, comfortable and independent. It is a home away from home, geared to the size, pace, and interests of the young child. The materials are child-sized and laid out in an orderly fashion on low shelves that are within easy reach of even the smallest child. The Children’s House is an educational environment for children 3-6 years old. Dr Montessori observed that children in that age range absorb information effortlessly and without limit in the quest to become part of their society and culture. To this end, great care is taken to prepare a classroom environment rich in beautiful learning materials. Children between the ages of 3 and 6 are grouped together in their own mini-society. The younger children learn by observing the older ones, who in turn benefit from their responsibilities as role models. The dynamic of this mixed age group effectively facilitates the children’s social, intellectual, and emotional development. In the Children’s House, the children choose their activities independently and move from one to the next at their own pace. A calm, peaceful atmosphere is maintained to permit concentration for surprisingly long periods of time. The child’s innate passion for learning is encouraged by providing opportunities to engage in spontaneous and purposeful activities. Each child is carefully observed and guided by a trained adult who presents materials incrementally as the child reaches developmental readiness. Children naturally cultivate individual work patterns, and are thus encouraged to work at their own pace. The trained adult does not teach the child, but rather puts him in charge of his own learning through fostering his exploration.